Posted August 2, 2011 by William Martin & filed under Galleries. 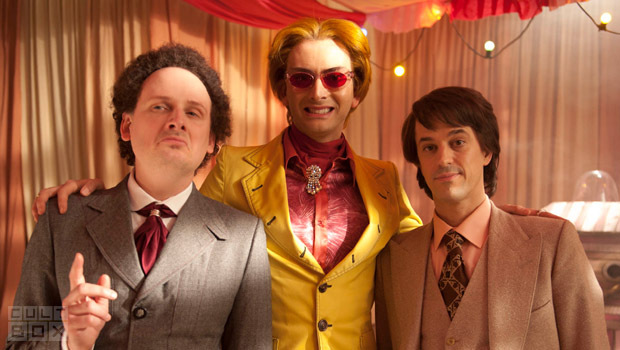 Sky Atlantic have released two new images of former Doctor Who star David Tennant in their new comedy series This Is Jinsy, as you’ve never seen him before. Written by and starring newcomers Chris Bran and Justin Chubb, the channel’s first original comedy commission is directed by Matt Lipsey (Psychoville, Little Britain). 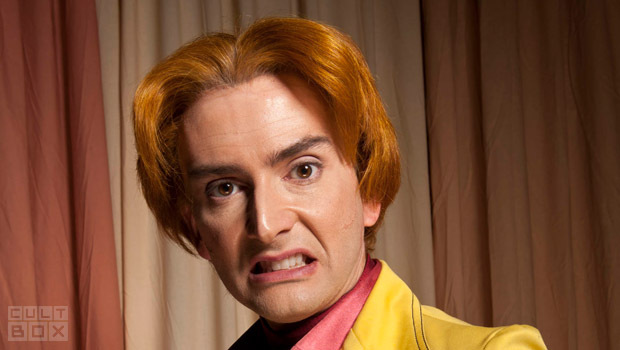 Tennant will guest star as Mr Slightlyman, a corrupt, camp wedding planner with bad plastic surgery, while his Doctor Who Series 4 companion Catherine Tate will play Roopina Crale, Chief Editor of ‘Glove Hygiene Monthly’. Other guest stars include Harry Hill, Simon Callow (Four Weddings And A Funeral), Peter Serafinowicz, Brian Murphy (George And Mildred) and KT Tunstall. The eight-part series is set to air in September on Sky Atlantic.